These have been my own thoughts and feelings all weekend. Thank you for having the courage to write them! I agree, it was a TREMENDOUS missed opportunity. I'm sorry you felt this way, too. Though I am hopeful for more opportunities to unite, despite differences. Thank you for sharing! 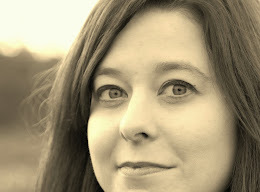 Hi Anna, it's good to see you on the blog. As you are aware I am a woman and I'm also unapologetically pro-life. I feel like my opinions are constantly attacked and minimized in today's world, but I've got nothing to prove at my age, so I seldom care what anyone thinks. The Pro-life March in Washington is this coming weekend, I believe. It will be massive but almost ignored by mainstream media. As always, Danni, I appreciate your visit and your thoughts. I am highly curious to see if this Saturday's March for Life turnout is affected by the lack of inclusion in last weekend's march. I'm not sure, as you stated, we'll get a full accounting of the upcoming March for Life by the media (as history has proved), but as always I love to see We the People exercising our democratic rights of peaceful protest. Hope you are well, Danni. Wonderful to see you. When did our entire society get the memo that unity means making sure everyone else believes in my values? It is scary how fractured our society has become. It seems most are so concerned that no one tramples their rights that they have a right to trample anyone and anything that gets in their way. Is it any wonder some of us refuse to so much as put one toe into the arena? Who wants to be trampled? You're right, Lisa. 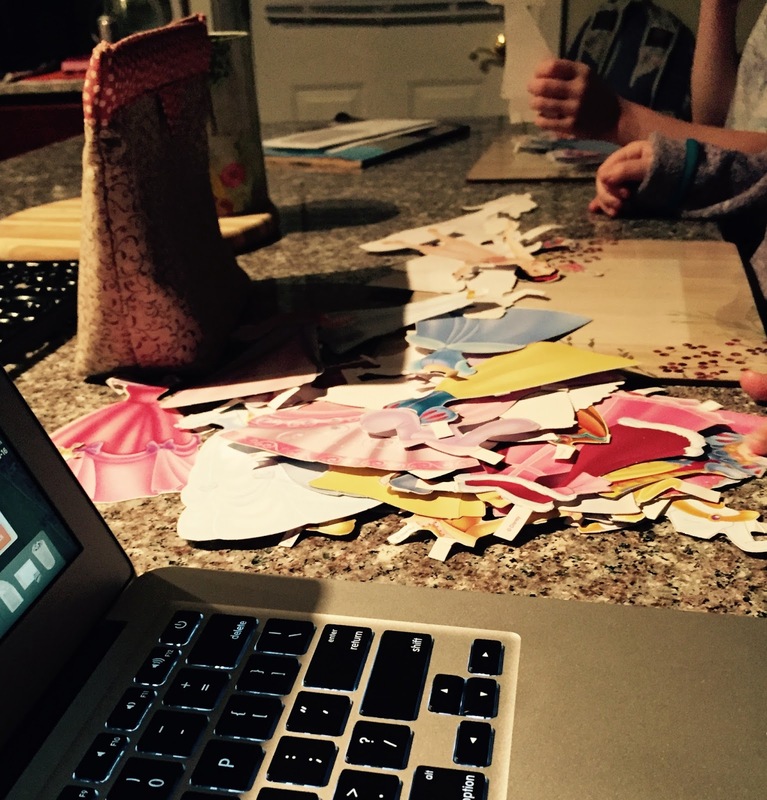 Our society is indeed fractured, and it seems that the only way to start repairing some of those cracks is by listening and responding with grace. Grace and empathy. And it has to start somewhere, even if it is just by dipping a toe in the arena. Scary business, indeed, because you're right. No one wants to be trampled. I believe that the annual March For Life in Washington, DC is this coming Friday, 1/27/2017....not Saturday. I wouldn't want any of you to miss it by going a day late. Thank you for clarifying that, Dan! So so good. I appreciate your ability to write in such an encouraging way. You are brave and sweet and such a good example. 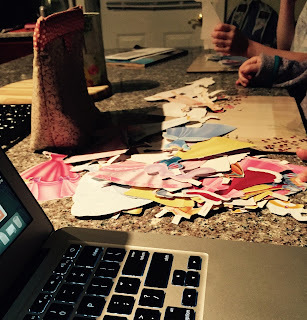 Anna, I am always eager to read your thoughtful words, and this blog post is no exception. I am listening to your anger and frustration, and I want to tell you I stand in agreement with your calls for fighting for safe places for women to go, for equal pay, and for access to decent, affordable healthcare. These are all essential platforms we should be working for. I love you, and I cherish our friendship so dearly exactly because of our sometimes wildly differing perspectives; because they always rest on a bed of trust, openness and honesty. I value your opinions and points of view because while I don’t always agree with you, you always give me opportunity to think and reflect and grow as a person. 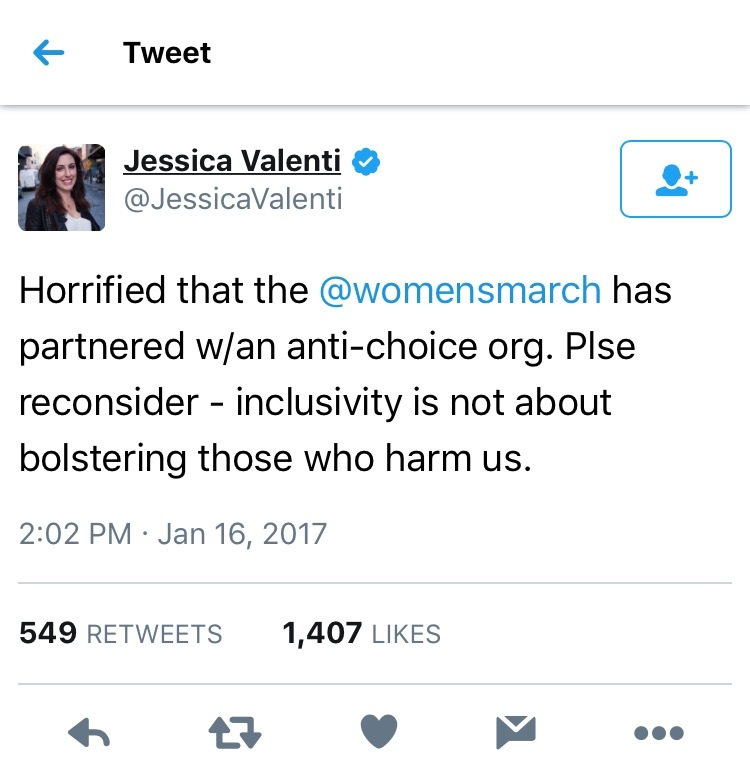 I agree that Jessica Valenti’s “horrified” tweet is off-putting, insulting, and alienating, and I am sorry. Because while I agree that minds about this topic in particular are rarely changed, language is important and we on both sides would do well to recognize that the “other” side has a right to respectful discourse. 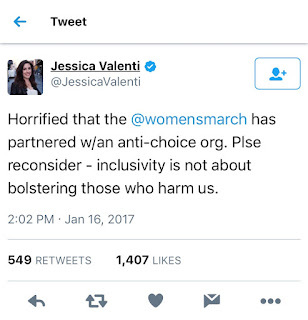 With that said, I will respectfully stand in defense of the Woman’s March platform calling for the right to reproductive freedom, and disagree that it should be (or even could be) separated from the other Unity Principles and this is why: A progressive agenda (and just to be clear, this is what the organizers of the Women’s March unapologetically claimed their Unity Principles to be) recognizes that reproductive freedom is inextricably bound to and cannot be separated from other issues that affect women, including the ones you brought up and I mentioned above. This is because reproductive freedom is essential to a woman’s right to self-determination, and the right to self-determination is essential to full equality. In other words, reproductive freedom IS economic freedom, and economic freedom ensures a woman her right to life, liberty and security of person. Having qualms about abortion doesn’t stand in conflict with a platform of reproductive freedom. Championing policies that restrict or eliminate or deny a woman’s right to choose what is best for herself and her family, however, does. I am truly sorry for your friend who, opting for one herself, said she felt stuck. But abortion isn’t what made your friend feel stuck. Abortion is what gave your friend a choice. Millions of women have been able to fulfill their dreams of self-actualization and full personhood because of reproductive freedoms, including access to legal and safe abortion. Champions of reproductive freedom also recognize that banning abortion doesn’t end abortions, it only ends safe abortions, and unsafe (and also unregulated) abortions are demonstrably harmful to women. So until empirical evidence mounts overwhelmingly to show that women are MORE harmed by freedom of choice than by restrictive reproductive policies that subjugate a woman’s autonomy and adversely affect her health, a progressive feminist agenda will never include a platform of restrictive reproductive policies, and it can never exclude a platform championing a woman’s inalienable right to full reproductive freedom. That, dear friend, is my best attempt at explaining where I (and the progressively influenced Unity Principles Platform) come from and why, and I am offering it as an explanation, not an argument. Because I do not doubt that we on all sides of the political spectrum share a sincere desire to raise our daughters (real and metaphorical) in a country that will recognize them as equal citizens and value them for all the qualities you mentioned, even as that shared hope is shaped by a diametrically opposed worldview, one which is inseparable from the core values we hold. I agree, dear Liza, that our wildly differing views are precisely why I love and value our friendship. And I appreciate your articulate and insightful explanation. There is more I could say in response to it, but I think our time would be better served by me emphasizing that our discussion here is exactly the kind of open and respectful discourse I wish could happen more often. Even leading up to the march, this reasonable rhetoric would have been helpful to me (and I'm sure others) to quell some of our frustration, though not all. I still believe an opportunity was lost. That the 7% that we don't agree on became the dividing line for inclusivity. (Is that a real word? Spell-check says no.) That said, I loved watching the hoards of women, the sea of pink, filling DC (and so many other cities) and loved seeing your posts and pictures and was rooting for you - especially since seeing that ocean of women overwhelmed my introverted self (and I know you feel me on that count). So the fact that you pressed on makes me so proud. Heaps of love to you, Liza.